When we produced High Fidelity last season, we realized that the show places us squarely inside Rob’s head. He narrates his own story and we hear everyone in his life in the musical vocabulary of Rob’s favorite recording artists. We get the story only from Rob’s point of view, which is very organic to the novel the show was based on. With Next to Normal, we’re not really inside Diana’s head, since we see parts of the story that Diana is not present for. But we are inside her world, a world where things don’t make sense as often as they do. When Diana suddenly hallucinates her new doctor singing like a rock star, we share that hallucination. When Diana slips into delusion, we experience that delusion with her. One of the show’s central points is that mental illness affects not just the person suffering from the illness, but also everyone around them – in this case, including the audience. The story’s other big point, an existential view that it shares with Passing Strange, is that everyone has his own journey and his own destination – or as Passing Strange puts it, his own Real. You can’t follow someone else’s path, because their Real is different from your Real. Diana has to find her path, but throughout much of the show, everyone else is telling her what that path should be. Like Company, the end of Next to Normal is ambiguous. Diana takes action, but we have no idea what the results of that action will be. Will she be better? Worse? Those answers aren’t the point of this story. The point is that Diana finds her path. Just like Bobby in Company. 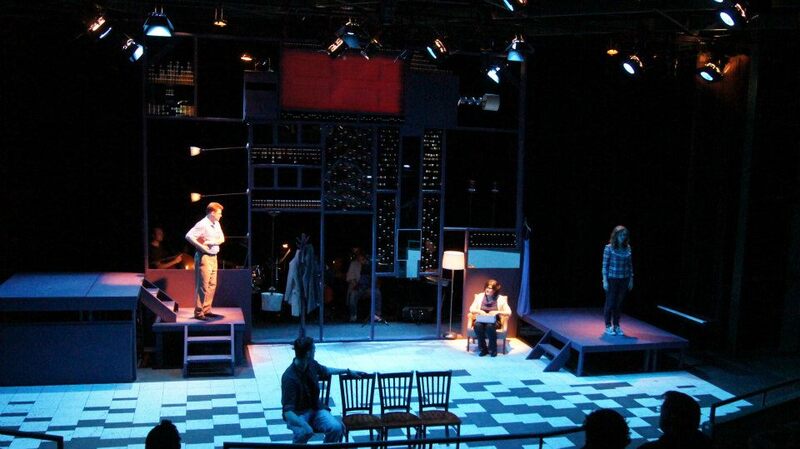 Like many of our shows, Next to Normal is a Hero Myth. Actually, it’s a double Hero Myth, because Natalie travels through her own Hero Myth as well. Each of the women are forced into their journey, encounter obstacles, pick up companions along the way, do battle with an “Evil Wizard,” and they each find new wisdom to point them forward. Most musicals used to be love stories because musical theatre is an inherently emotional storytelling form. But as musicals became more personal and as our culture changed, musical theatre began shifting to the Hero Myth, every bit as emotional a journey as any love story. As I’ve argued many times, people don’t go to the theatre (or movies) for escape, despite what the shallow types will tell you; they go for connection. To make sense of the world around them and their own lives, to be reminded that we all go through essentially the same trials, that we are not alone. Sondheim says the point of art is to make order out of the chaos of our world. Art selects from life, focuses, juxtaposes, reveals, magnifies, all in the service of telling a meaningful story that helps us navigate the rough terrain of being human in the 21st century. You don’t have to be bipolar to see your own daily struggles in Diana’s more extreme struggles. And that’s why storytelling is important to the culture. And why we make theatre. And why lots of people find Next to Normal so genuinely powerful and incisive. Enjoy the ride.